On the second Wednesday of each month I join some very talented blogging friends for a project challenge, and with a different theme each time it’s really a lot of fun. This month’s challenge is mirrors. But I mean it in a slightly different way than you might think. You’ll see what I mean when you see the finished project. 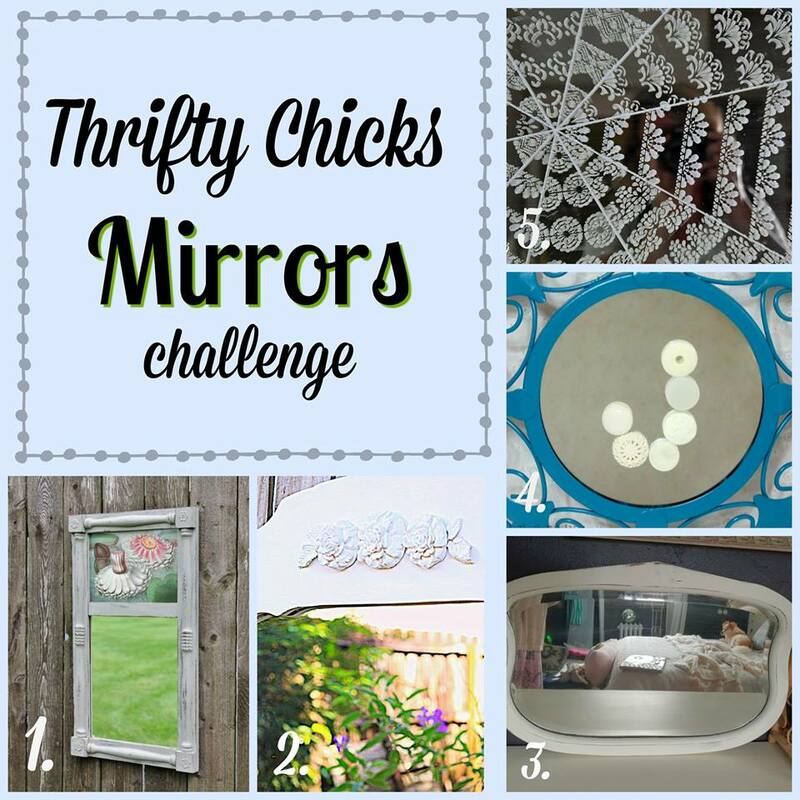 I’m so excited to see what my blogging friends have come up with for this month’s mirror challenge. You’ll find links to their projects at the end of this post. Be sure to visit and check out all the fabulousness. But first I’ll share my project with you. I love mirrors because they can be used in our home’s decor in so many ways. For my project I decided to create a repurposed mirror sign. Now there are some people in the designing world who think that the whole words on walls thing is out. I’ve heard more than one designer recently say that, but like everything else that’s a matter of opinion. Now I would agree to that when it comes to signs just for signs sake, or if someone is putting up words or signs just to follow a trend. But as a lover of words, and since I don’t care the least little bit about trends, I say that words that mean something to you, that make you feel something, or that bring back some happy memories, are absolutely 100% always in. Like my vintage window screen signs. It’s really just all about what words or phrases mean something to you. Now that I’ve gotten that off my chest, lol, let’s get on with this repurposed mirror sign project. 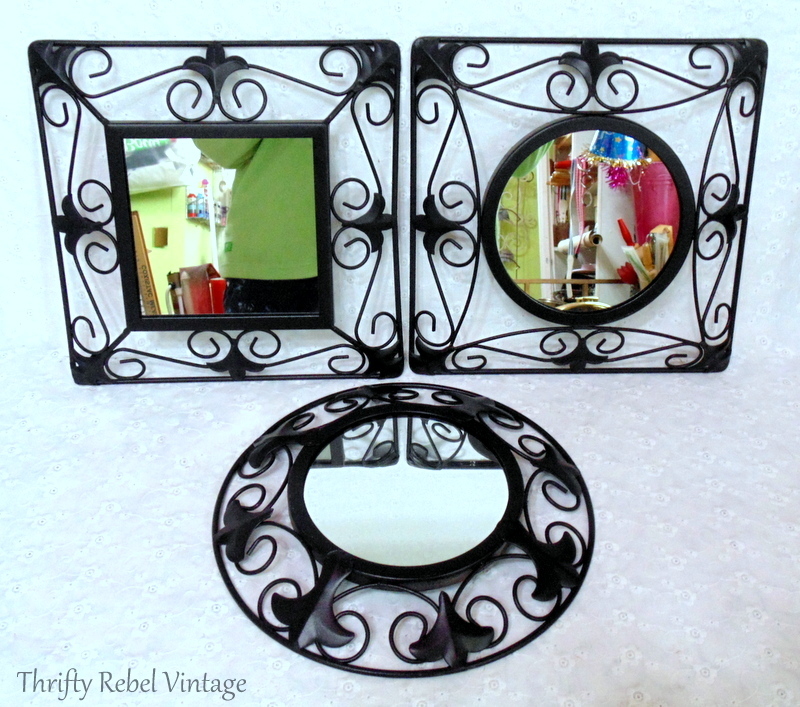 I’ve had these three thrifted mirrors for what seems like eons. I thrifted them as a set, and they’ve been patiently waiting for their project day to come along… and it finally did. You could do this project with one mirror as well. It just depends what you have on hand or what you can find in your neck of the thrifting woods. And also finally… I’m doing this project for my long-stalled living room makeover, which I’ve started up again thanks to What I Learned From A Pig. Thanks Miss Pinky! 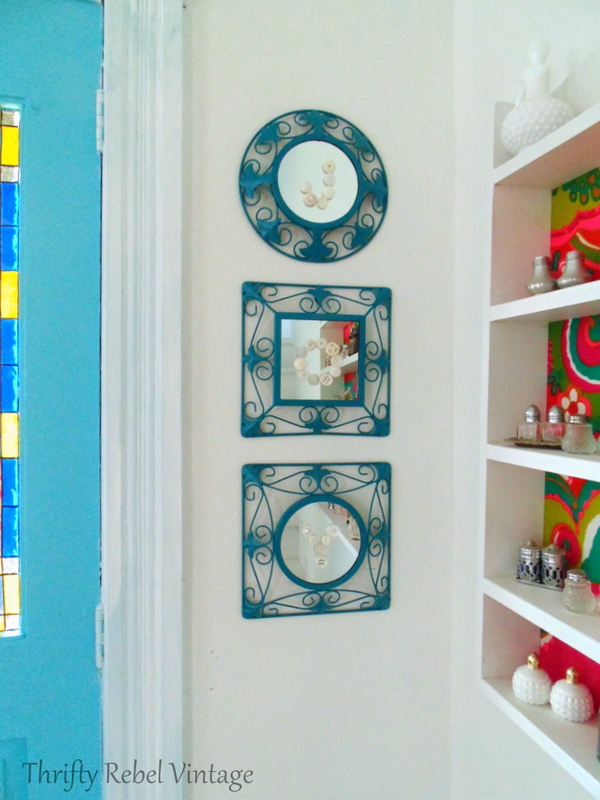 The first thing you’ll need to do is tape off the mirrors with paper cutouts and painter’s tape. Then you can spray paint them any color you like… with 3 light coats. I used a color called Lagoon. It’s a lovely deep aqua blue. If you love the color your mirror already is that’s awesome. Less work is always a good thing. This is a very simple project with only a few supplies needed… painter’s tape, buttons from my thrifted button collection, and E6000 glue. E6000 glue is perfect for a project like this because it’s transparent, and it works so well with just a little dab. Remember to check which end your hanger is on the back of the mirror. I had mine upside down when I was placing my J buttons on the first mirror, but thankfully I noticed before I started gluing. To make the letters for my sign I’m using my button stash of white/creamy buttons. I chose buttons of different tones, styles, and textures for added interest. The best way to glue the buttons on to the mirror is to place them the way you want them and then glue them down one at a time. That way you won’t lose your placement. I could have chosen pink or green buttons, because those colors will also be in my living room along with blues. But I chose white/creamy for a reason, and I’ll explain that further down when you see the finished project. If you choose regular buttons for the letters, ones that have holes that go right through them, it’s important to use as little glue as possible so it doesn’t ooze out the holes. I found it best to put very little dots of glue on the outside area around the holes, but not too close to the outside edge of the button. You don’t want the glue to ooze out the button edges either. If you find too much glue is coming out of the tube you can try using a toothpick to apply the glue to the backs of the buttons. Some of the buttons I chose had raised posts on the back that stuck out too much. I twisted those off with needle nose pliers before gluing them on. When I twisted a few of the posts didn’t come off perfectly cleanly. They left little bits sticking up,. I tried flattening one button back with a hammer, and smashed that button into smithereens. Ooops! But it’s all good, and on to plan b I went, which was adding a healthy dab of glue over those bits. It doesn’t really matter if a button sits a little wonky as long as it’s glued on securely. Here you can see my JOY repurposed mirror sign in place on my wall beside my original antique living room door. It fills the space of this little wall nicely, and I think it complements my salt & pepper collection shelf. How to place the mirrors is a completely personal choice. I didn’t want the O of the word JOY to be in a circular mirror because it’s also circular. I don’t really know why, but that would bug me. It’s just a gut thing. 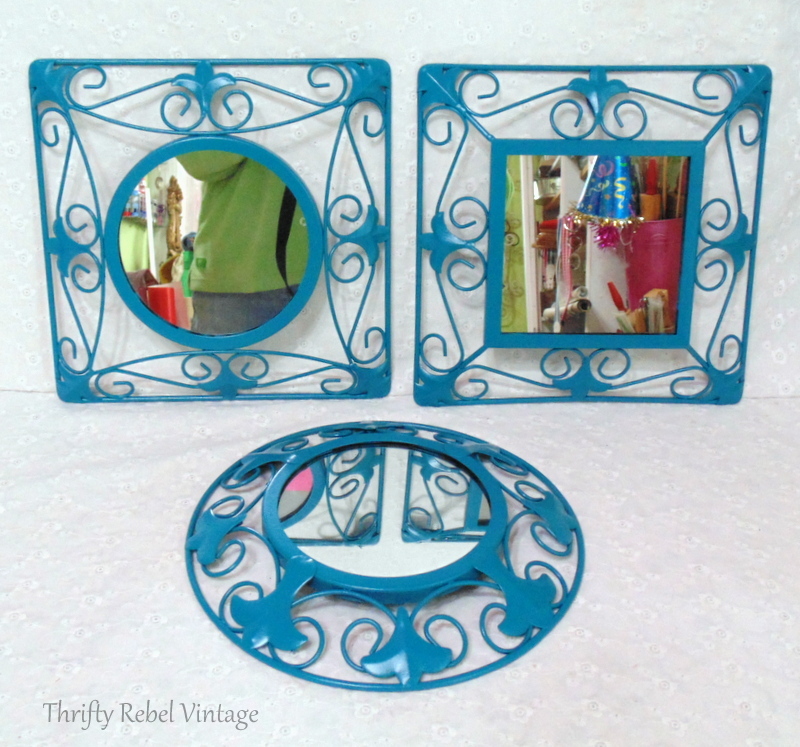 And I also didn’t want the completely circular framed mirror and the square frame with the circular mirror together. Say what? lol. That’s because the two circular mirrors would be together, and that would bug me too. Again, it’s just a gut thing. 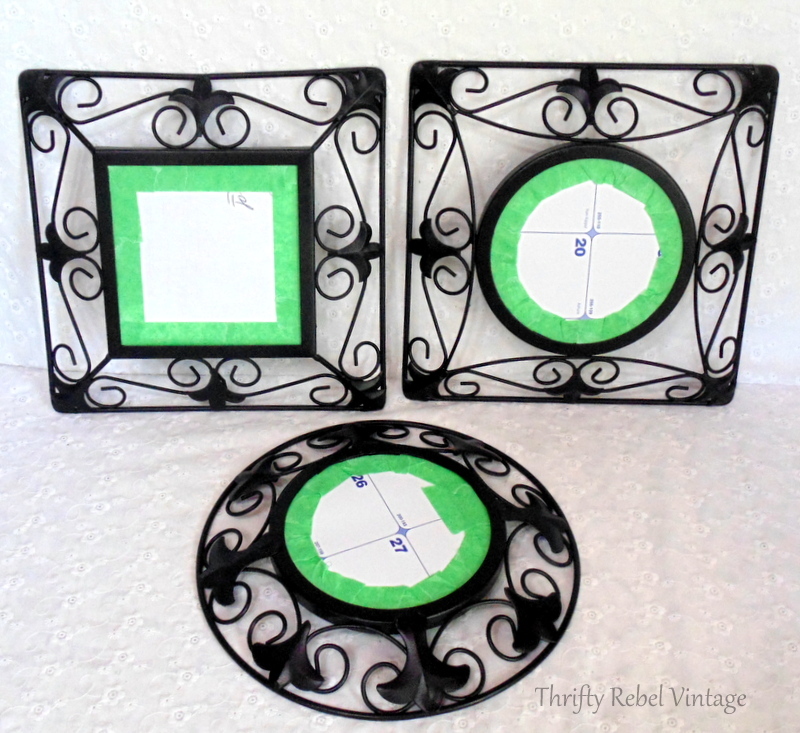 So I opted for the square mirror within the square frame to be in the middle. For whatever reason the two square frames being together doesn’t bug me. I guess it’s just a round mirror thing. lol. Go figure! Honestly it sounds way more complicated than it was. It took w-a-a-a-y less time to figure that out than it did to explain it. lol. 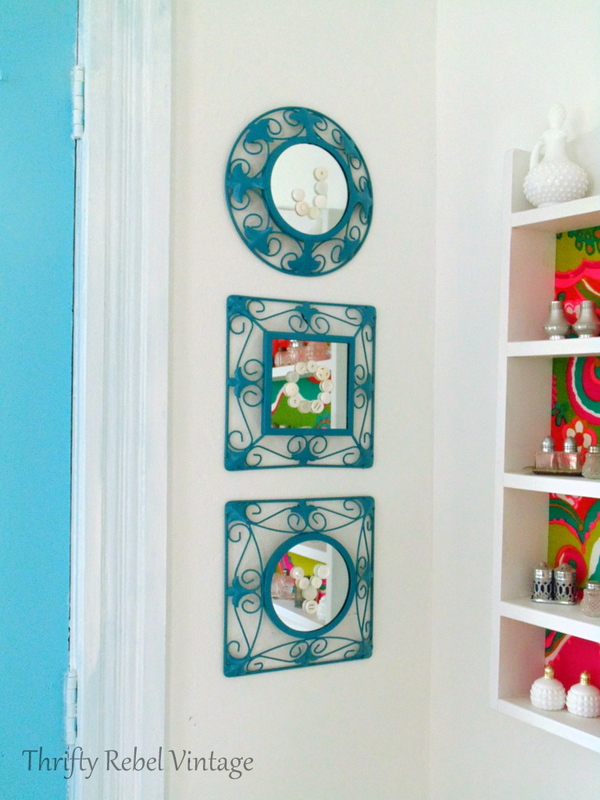 And yes, the walls of this color-loving girl’s living room are white. Can you believe it? It’s even a bit of a shock to me. I fell in love with the white walls in my aqua and red kitchen makeover because they really showed off all the color, and I’m hoping for the same result in my living room. Now on to the reasons that I chose the white/creamy buttons. The first reason was for their subtlety. They stand out more or less depending on where you’re viewing the mirrors from. The second reason is that I wanted the Lagoon color mirror frames to be the stand out most of the time. I love the pops of that color against the white wall. And the third and most important reason that I chose them is this view that I see every morning as I come down the stairs. Words are powerful… and our home’s decor should help empower us to face the world. So what better place is there to display meaningful words than in our homes? This repurposed mirror sign is not only reflecting light, but it’s also reflecting JOY back onto my own image every time I walk down the stairs. And that’s very powerful to me. It reminds me to begin each day with a smile on my face and joy in my heart, no matter what else is going on. Since I rarely wear white or cream, I’ll always see these JOY buttons no matter what color I’m wearing. Home decor should not just be about pretty or trendy things… but also, and more importantly, it should be about meaningful things. No matter what the trends of the time may be, meaningful words and signs will never be out of style. So what would your word be? What would your sign say? 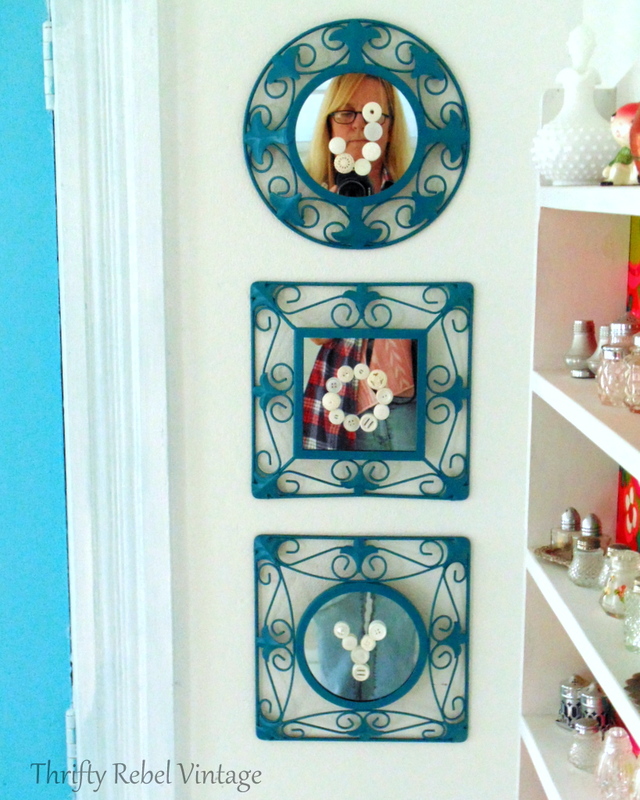 Now be sure to check out what my fabulous friends did with their mirror projects. Very sweet! 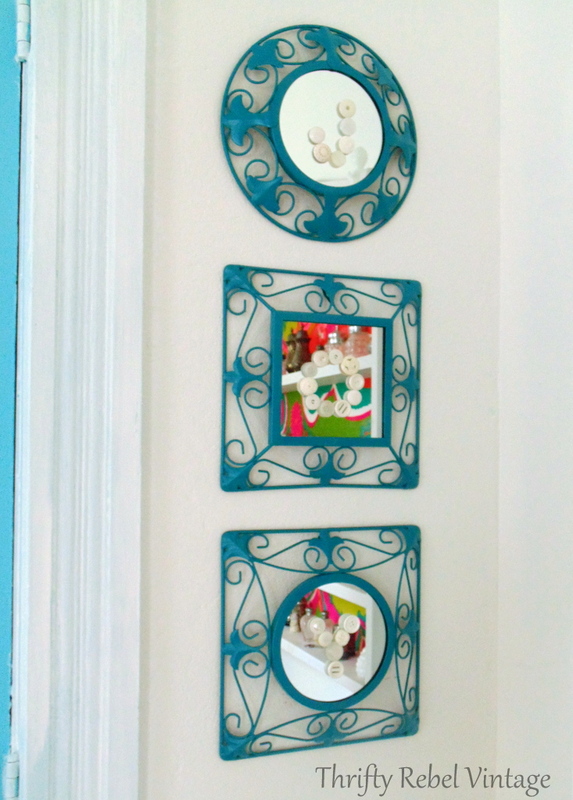 Love the color of the frames and of course I have a passionate love for vintage buttons, so it speaks to me too. This is great Tuula! The mirrors turned out beautifully! Great idea…thinking the round mirror should be in the middle…just my opinion. Love the button idea, very unique & interesting with all the different sizes & patterns. Thanks Olivia! That is such a cute idea. 🙂 And yes, we all deserve joy in our lives every day… not just at Christmas time. I agree on so many points that you made. I think your mirrors turned out great. Since this project gives you “joy” that is all that matters. I personally like signs and think they will be around for a long time. Thanks so much Dona! Can’t really explain those gut feelings, but I tend to go with them most of the time because they’re usually right when it comes to what works for me. I don’t think there’s a right or wrong here really, it’s just personal preference. Love how this turned out, Tuula! 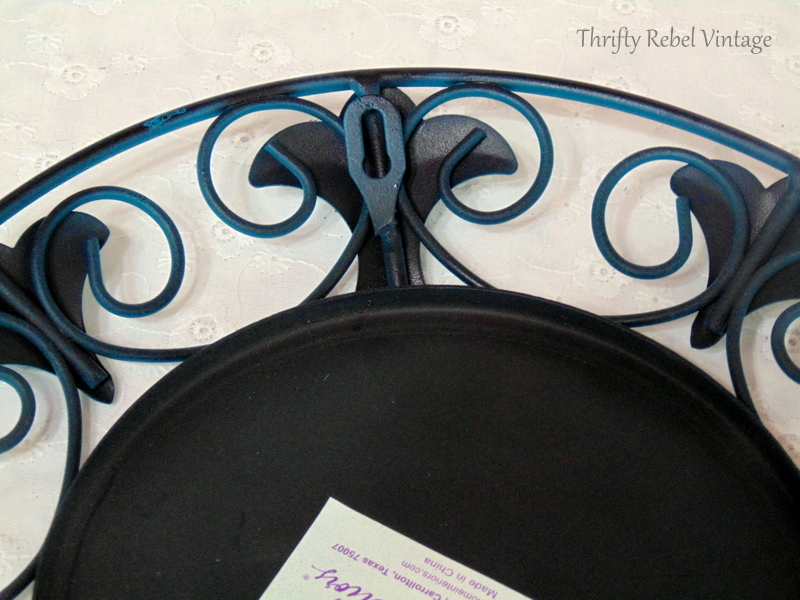 And love your choice of word near your entry, too;) Think I used lagoon on one of my outdoor tables-nice color. Glad you shared your “undone” projects with us…we all have them! I couldn’t agree more Tuula. Trends are overrated and if words make us happy, bring on the words! This is such a cute idea for the holidays or year round. I might steal a version of this idea for my front entry during the holidays. Super cool, creative and joyful! I love the whole bright, and beautiful space!